2WOLight skin with warm olive undertones. 3,5NLight medium to medium skin with neutral undertones. 4,5NMedium to tanned skin with neutral undertones. 4WOMedium skin with warm olive undertones. 5NMedium skin with neutral undertones. 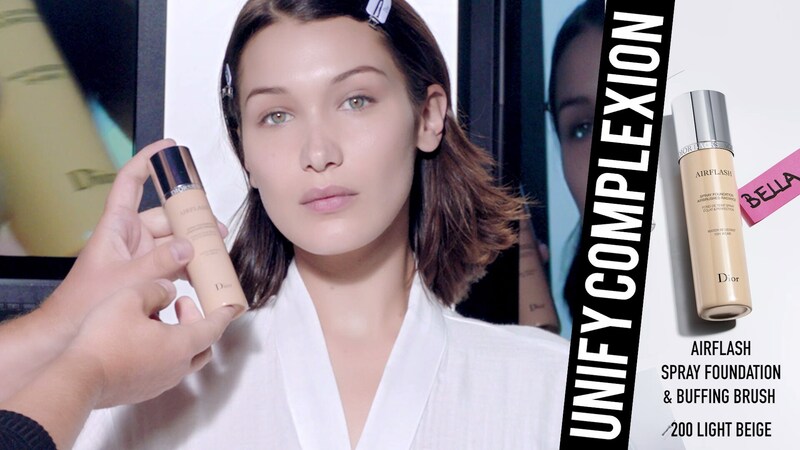 Inspired by Backstage makeup techniques and put to the test by Peter Philips, Creative and Image Director for Dior Makeup, this fluid spray foundation guarantees a perfect, flawless complexion every time. Enriched with light-diffusing pigments, it instantly smooths the skin and boosts radiance for a perfect complexion that lasts all day, even on the runway. 1. To apply Dior Backstage Airflash, shake the can for 5 seconds. 2. Spray 20 cm (8 inches) from the face in a Z formation. 3. For optimal makeup results, spray onto the Dior Backstage Buffing Brush and apply in small circular motions to the face, gently dabbing onto areas that require more coverage. Repeat as needed until you achieve the desired coverage. The water-resistant formula ensures 12-hour hold and colours that stay true. * Its ultra-fluid and ultra-fine texture allows for buildable, custom coverage to suit any skin tone and texture. * Instrumental test on 20 people. The Airflash range has expanded to include 8 new shades that adapt to the cool tones or warmer tones of any skin colouring. Flawless coverage and a long-lasting finish for a radiant, glowing complexion.